The Hamburg Ravensbrück trials were a series of seven trials for war crimes against camp officials from the Ravensbrück concentration camp that the British authorities held in their occupation zone in Germany in Hamburg after the end of World War II. These trials were heard before a military tribunal; the three to five judges at these trials were British officers, assisted by a lawyer. The defendants included concentration camp personnel of all levels: SS officers, camp doctors, male guards, female guards (Aufseherinnen), and a few former prisoner-functionaries who had tortured or mistreated other inmates. In total, 38 defendants were tried in these seven trials; 21 of the defendants were women. Executions relating to these trials were carried out on the gallows at Hamelin prison [de] by British hangman Albert Pierrepoint. All seven trials took place at the Curiohaus in the Hamburg quarter of Rotherbaum. The first Ravensbrück trial was held from December 5, 1946 until February 3, 1947 against sixteen Ravensbrück concentration camp staff and officials. All of them were found guilty. One died during trial. The death sentences (except for Salvequart) were carried out on May 2—3, 1947, in Hamelin prison. Three more defendants, the camp leader, Lagerkommandant Fritz Suhren, along with "work leader" Hans Pflaum and Schneidermeister Friedrich Opitz (below, see the Second Ravensbrück trial), escaped from prison prior to the first trial. The first two of them were apprehended under assumed names in 1949. They were handed over to French authorities, who were conducting another Ravensbrück trial in Rastatt at that time; both men were sentenced to death in that trial and executed by a firing squad on June 12, 1950. Opitz faced trial in November 1947. Female prisoners gathered when the Red Cross arrive to Ravensbrück in April 1945. The white paint marks shows they are prisoners. In the second Ravensbrück trial, which lasted from November 5 to 27, 1947, the only defendant was Friedrich Opitz age 49, a clothing factory leader in the camp employed there from June 1940 till April 1945. He was recaptured after his earlier escape from prison along with Fritz Suhren and Hans Pflaum (see above). During trial, he was convicted of beating women with truncheons, belts and fists, starving them for missing the quota, keeping them outside in very long roll-calls, and sending them to the gas chamber for (what he called) "being useless", as well as of kicking, at least one Czech female inmate, causing death. He also encouraged his guards to do the same. Opitz received a death sentence, which was carried out on January 26, 1948. 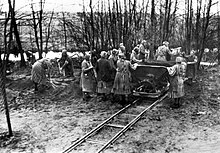 In the third Ravensbrück trial, the so-called "Uckermark trial" which took place from April 14 to 26, 1948, five female camp officials of the satellite Uckermark concentration camp, were indicted for the mistreatment of women and the participation in the selection of women for the gas chamber. The Uckermark subcamp was located about one mile from the Ravensbrück concentration camp. It was opened in May 1942 as a prison or parallel concentration camp for teenage girls aged 16 to 21 dubbed criminal or difficult by the SS. Girls who reached the upper age limit were transferred back to the Ravensbrück women's camp. Camp administration was provided by the Ravensbrück main camp. In January 1945, the prison for juveniles was closed although the gassing infrastructure was subsequently used for the extermination of "sick, no longer efficient, and over 52 years old women" from Ravensbrück . Braach and Toberentz were acquitted because they had worked at Uckermark only while it was still a juveniles camp, and there were no Allied women there at that time; the camp was exclusively for German girls, whose fate or treatment was outside the remit of the tribunal. The fourth trial was held from May to June 8, 1948. The accused were all members of the medical staff of the camp at Ravensbrück, including one inmate who had worked as a nurse. The charges again centered on mistreatment, torture, and sending to gas chambers of women of Allied nationality. Ganzer had already stood trial for her activities in Ravensbrück in 1946 before a Russian military tribunal and had been acquitted. In Hamburg, she was found guilty, but her death sentence was commuted into lifetime imprisonment on July 3, 1948, which in turn was reduced to 21 years' imprisonment in 1950 and then to 12 years in 1954. She was finally released on June 6, 1961. In the fifth trial, three SS members were accused of having killed Allied inmates. The trial lasted from June 16 to 29, 1948. The judgments were handed down on July 15, 1948. This trial lasted from July 1 to 26, 1948. Both defendants were accused of having mistreated Allied inmates. Finally, six Aufseherinnen (female camp wardens) were tried from July 2 to 21, 1948. The charges were mistreatment of inmates of Allied nationality and participation in the selection of inmates for the gas chamber. ^ a b Jewish Virtual Library (2014). "Ravensbrück Trial (1946-1947)". Cyber encyclopedia of Jewish history and culture. Retrieved 6 January 2015. ^ Kretzer, Anette (2009). NS-Täterschaft und Geschlecht. Der erste britische Ravensbrück-Prozess 1946/47 in Hamburg [Nazi perpetrators and gender. The first British Ravensbrück process 1946/47 in Hamburg]. H-Soz-Kult-Zentralredaktion - Humboldt-Universität. Reviewed by Ljiljana Heise, Friedrich Meinecke Institute of the Free University of Berlin. Berlin: Metropol Verlag. ISBN 978-3-940938-17-6. Retrieved 6 January 2015. ^ a b c Silke Schäfer (6 February 2002). Zum Selbstverständnis von Frauen im Konzentrationslager. Das Lager Ravensbrück [On the self-image of female prisoners in the concentration camp environment. The camp Ravensbrück] (PDF). Doktorin der Philosophie Dissertation. Fakultät I Geisteswissenschaften der Technischen Universität Berlin. pp. 35, 65, 253. Archived from the original (Internet Archive) on November 13, 2014. Retrieved 7 January 2015. ^ Michael J. Bazyler, Frank M. Tuerkheimer (2014). The Hamburg Ravensbrück Trials. Forgotten Trials of the Holocaust. NYU Press. p. 148. Retrieved 6 January 2015. ^ Bazyler, Michael J.; Tuerkheimer, Frank M. (2014). Forgotten Trials of the Holocaust. NYU Press. pp. 147–149. ISBN 978-1-4798-8606-7. Retrieved 2019-01-11. ^ Ebbinghaus 1987, p. 287. Richard Clark, Ravensbrück concentration camp. Female Nazi war criminals. Capital Punishment U.K.
Ebbinghaus, Angelika (1987); Opfer und Täterinnen. Frauenbiographien des Nationalsozialismus. Nördlingen 1987. Reprinted 1996: ISBN 3-596-13094-8. In German. Wikimedia Commons has media related to Ravensbrück trials. Taake, C.: Angeklagt: SS-Frauen vor Gericht; Bibliotheks- und Informationssystem der Univ. Oldenburg, 1998. In German. This page was last edited on 16 February 2019, at 21:05 (UTC).